Clark Tanks’ feed and water troughs are a light and robust feed solution for animal husbandry. Standard colour is black or select from a range of ColorBond colours. 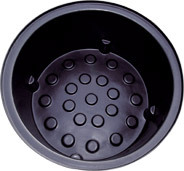 Sizes range from 360 litres to 3,500 litres. Check the specifications tables below for available options. The new safety tread trough allows cattle to get a grip if they are pushed or fall into the trough. The safety tread pattern allows the cattle hoof to safely lock into the centre of the tread, providing full grip and enabling the beast to get out of the trough.